High school is over for Matt, but his romance with Julie is not. They are still making out during season four. Eric, Tami and Julie Taylor of Friday Night Lights. Kyle Chandler, Connie Britton and Aimee Teegarden star. Say cheese, Julie Taylor you're having your photo taken! Noah Barnett (Austin Nichols) plays a new teacher at Dillon High School. Julie Taylor (Aimee Teegarden) is quite taken with him from the start. Reeling from her breakup with Matt, Julie now wishes he'd take her back... but Saracen has moved on to not one, but two other love interests. Amazing. 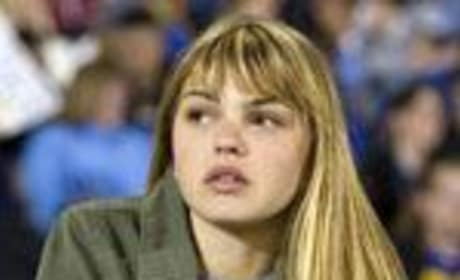 Julie Taylor (Aimee Teegarden) begs Matt to forgive her, then is sad when he appears to have moved on with Lauren, a new cheerleader in school. Her pained expression tells it all. Tami Taylor's sister Shelly (Jessalyn Gilsig) and daughter Julie (Aimee Teegarden) bond over revealing clothes and Dixie Chicks concerts. Tami feels jealous and over the hill. Matt Saracen and Julie Taylor won't be getting back together anytime soon, it looks like, even if Julie has seen the error of her bratty, selfish ways. Matt is still hurt and not having any of her apologies. It's no fun. In fact, it can be a very scary thing, teen driving. Allstate managed to finagle a whole storyline into the show about exactly that, then plug it with an ad at the end of the Friday Night Lights episode "Backfire." Eric arrives back in Dillon to find wife Tami, and daughters Julie and Grace very happy to see him. It's great to have a family together again. Tami rests and Julie whines and asks for attention. This is a trend that has been building ever since Eric has been gone. Wham! Tami Taylor, enraged at Julie arriving home well past curfew, then trying to flee after that, slaps her hard. She's not proud of it later, but what's done is done.